Here is something you don’t see very often. The extremely rare accessory 3-bar knock-off spinners for the “dog dish” hubcaps. These were available from the Chevrolet dealer in 1959 and 1960, but you just don’t see any around. These spinners sold for $10.75 retail price in 1959. 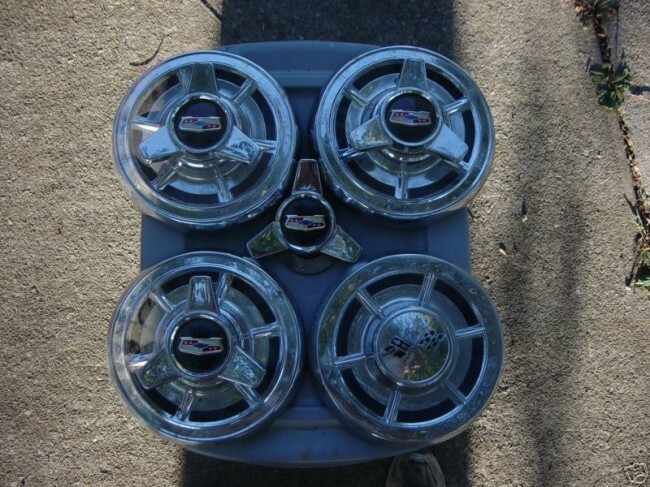 A set of full wheel covers was $23. If a buyer wanted to be a little fancier than just plain caps, he could buy these, but most likely he would have just ordered the car with full wheel covers. You might think these spinners look familiar. That is because the castings are the same as those used in ’57 and ’58, but for ’59 and ’60 they changed the background color of the plastic center to black instead of red. I suppose if you wanted to go through the trouble you could strip the red out of some reproduction ’57 spinners and paint black in there, but even so this rare original set with some pretty darn nice caps (hard to find too!) sold for over $400 on eBay.